DCP INDIA PVT. LTD., the owner of Brand ‘ASBAH’ have been in trading of various products and commodities has been declared as one of the winners of the Top 100 SME's of INDIA, 2016 by India SME Forum. 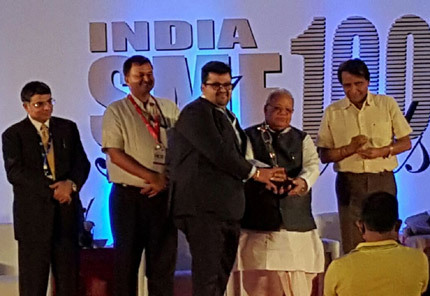 Mr. Gaurav Jain, Director of DCP INDIA (P) Ltd. received the prestigious award at the India SME 100 Awards Evening. KALRAJ MISHRA, Hon'ble Union Cabinet Minister of MSME, Government of India (Chief Guest), SURESH PRABHU, Hon'ble Union Cabinet Minister of Railways, Government of India and NARENDRA SINGH TOMAR, Hon'ble Union Cabinet Minister of Steel, Government of India (Guests of Honour). DCP INDIA has passed all the stringent evaluation processes & criteria laid down by the Jury Board of the 3rd Edition of India SME 100 Awards. The winners have been chosen based on their score on the financial parameters and non financial parameters of the evaluation format. ASBAH was born out of passion to create a better and a balanced society with a focus on Women Empowerment. Asbah strives to assure that the under privileged and deserving women across the globe having a dream to shine in the field of education, sports or professional field are able to fulfil their desire. To ensure that the Consumer gets the best quality, DCP India has set up a plant to process all the ASBAH products like premium quality Basmati Rice, Maida (Refined Wheat Flour), Dalia (Porridge), Poha (Rice Flakes), Sooji (Semolina) and Besan (Gram Flour).